- Death Machine: AKA Kettle Kin gets restored to its full uncensored chainsaw wielding glory. Not only is this a graphical hack, it also rewrites the its AI to perform just as it did in the original Japanese release. - Teleportation Circles: When Square released this game in 1993 Nintendo of America had strict policies against religious imagery appearing in its titles. The six-pointed stars in the teleportation circles were reduced to triangles. This hack restores them to their original appearance. 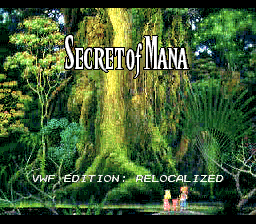 - Title Screen Background: When Square ported this game over to English, they butchered the original background image. Because of some graphical problems they cropped the image of the full Mana Tree at its roots and expanded it. The result is a blurry pixelated mess. Relocalized restores the original image. - Opening Text Crawl: Relocalized updates the opening text crawl to that of the superior HD version. - Relocalization: The titular feature. This hack takes the game's outdated, awkward, and inaccurate text and script elements and localizes them differently. Just like with FuSoYa's hack before it, Relocalized holds true to the style of beloved 90's Squaresoft translator, Ted Woolsey. Awesome! It looks like this is the definitive English version of the game. I'm looking forward to playing SoM again! This certainly looks awesome. Will this be compatible with the scroll hack? 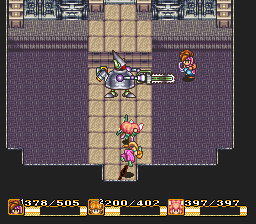 Now you have the most complete version of Secret of Mana of all time. Did you also patch your rom with the 1-MSU-1 (v1.0) by DarkShock (optional, only if you use the MSU-1 hack) ? Nice set up! I'm having trouble trying to get my own working so maybe you could give me some pointers? I tried to follow yours and changed it only slightly. Did you use the .ips file I provided? And by chance the rom you used was Secret of Mana (USA).sfc? Note that from step 1 to 2 must be without header. from 3 to 5 with header and from 6 to 12 without header again, did you follow this correctly? If you want I can send you my own rom already patched. Yeah, it's always possible to improve it... although each change might not please everyone, as always. One other thing that could be done is try to backport the fixes that the European release benefited from. Or simply fix bugs that were in all releases. There's an endless list of things that could be done, but anyway, I'm glad for all the work that led to this nice patch. Oh, my goodness, look at that title screen! I hope to play through this eventually (soon?). 1. Isn't VWF Edition redundant? Applying redundant patches only results in bad mojo, I wouldn't do that. 2. Same with Proper-Caser, because it looks like some things are properly cased (protag's name). I'm no stranger to big lists of patches, but I'm just making sure. Oh, your compilation IPS works totally fine my dude but I did want to remove and replace a few hacks. Specifically the drop table hack as I don't want any items deleted and feel Timbo's equipment overhaul is probably a better way to go about things. I essentially slotted it in where I thought it would be best to apply it before lv 9 weapons and Relocalized as I feel like they'd edit code related to equipment, chests and shops possibly. Plus Equipment Overhaul requires an unheadered rom too. I just can't figure out why it won't work. Excuse my ignorance, but am i correct in saying that if all I wanted was the relocalisation and scroll hack, I would simply first apply the Scroll Hack, and then apply the relocalisation. Is that correct? Bahabulle: Created the tools used to edit the text crawl. Before the release of the Relocalized hack, it was this list of hacks that worked for me, only needed to apply the Relocalized patch after it continued to work perfectly, but I tried to apply Relocalized first and then later hacks like 9-items and Drop table balance and they all gave problems. You can try to remove one or another item from the list and try to see if it continues working, as this combination is working for me, I'd rather leave it as it is. Looking pretty good, this might be the definite edition to play SoM. In that case either way, the problem of the Scroll hack I was having was when mixed with others, then you can apply it before or after only with the Relocalized hack without problem, in fact try your own combination until you find the one that works the most. I just can't figure out why it won't work.